When people see me working on costumes the most heard comment is: ‘Doesn’t it take forever to finish a costume?’. My common answer is: ‘It does take quite some time’. I always wonder what the rationale is behind this question. Should I not start a project that requires a great deal of my time? Are they amazed that I am not getting bored by sewing thousands and thousands of sequins and beads to a costume? Or do they wonder how I have time to make costumes? My secret to costume making is my daily commute. For my day job I travel roughly sixty five km by train. Living on the outskirts of a city means taking the local train, and the local train uses app. 50 minutes to get to my destination. That’s fifty minutes of sleep, listening to music, staring out of the window, checking facebook updates on my phone…. or fifty minutes of costuming. This is my regular view: the screen on the top tells me we are travelling at 112 kmph. The seats are color coordinated with the project I am currently working on. At the end of the day when I am done with work, I have to take the same train back home. That’s another fifty minutes of costuming. The tricky bit is preparing workthat can be done in the train. For example, bringing a lot of supplies with me is out of the question. Bringing something with me that needs a lot of workspace is also a big no no. The tables are narrow and small and often I can’t get a seat at the window during rush hour. I learned to pack light, bring only the bare essentials for what I’m working on and to divide my work into chunks. For example, I am working on filling triangles with a random bead pattern. This is what I can get done in fifty minutes. For the record, this was the biggest triangle. I am not putting pressure on myself to finish something in the limited time that I have. Instead, I focus on motivating myself to get started. If I don’t feel like beading, I simply don’t. But I know how happy I am when I finish a costume and get to wear it. Working on a costume is essential to getting closer of the shiny prize at the end of the proverbial tunnel. And there’s another pay off! Beading works like meditation for me. It’s totally zen to not stare at a screen, to limit my vision to the fabric before me and not do anything else. Sewing can be kind of therapeutic for the very same reasons. When others see a box of beads and a seemingly endless project, they get stressed out. When I see a box of beads, I think of how lovely it will be when it is done. Another option is beading while watching the TV, something I used to do when I had more time on my hands. Something that requires little attention to follow the plotline is perfect. Nowadays I don’t watch much TV as it is. Too busy being home and running around after the little one, cooking dinner or being too tired to pick up a needle. What are your time saving tricks to get some sewing or costuming done? It’s recital time in my neck of the woods, otherwise known as ‘validating that I really need this many belly dance costume items by letting my students wear them’. It’s also an excellent opportunity to buy or make something new. This year my students got the colorscheme ‘blue and purple’. I dug up all my blue and purple items and started fixing things. 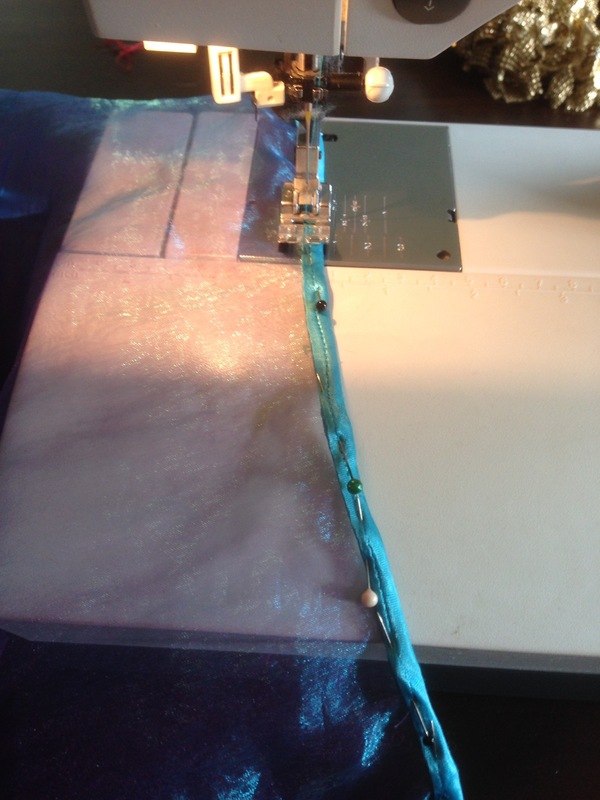 First up was a blue and purple changeant organza veil with bias tape edging. It is lovely but one pf the edges started to fray and the bias tape started to come off. 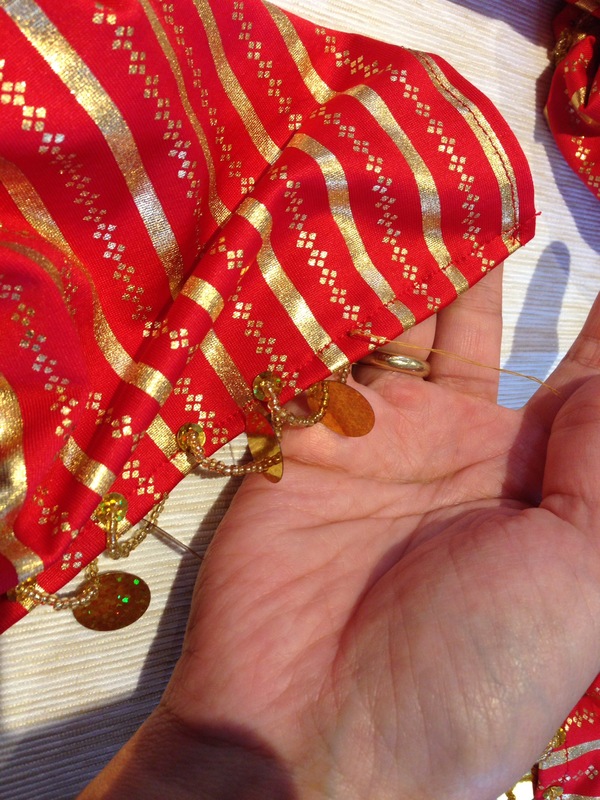 An excellent opportunity to write about using bias tape to finish the edge of a veil. Adding biastape is only useful if the veil itself is not weighed down too much by the edging. For example, a delicate silk veil woul become harder to handle with cotton or satin biastape along the edge. 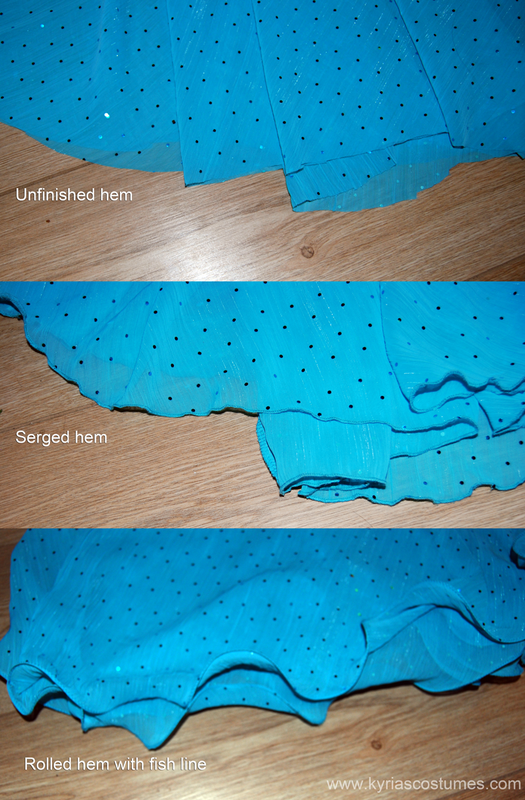 For organza, it really helps to get a better grip on the veil and to prevent ugly hems. Rolled hems on organza often look a bit rough. For edging the veil, use a zig zag stitch all around the veil to capture the fraying threads along the edge. 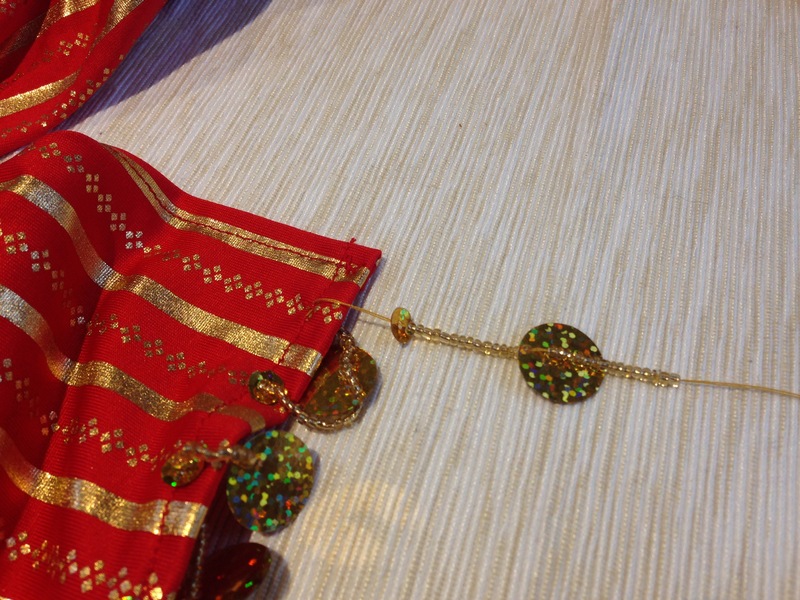 Take the bias tape (this is satin bias tape) and carefully fold and pin it along the edge. This might take a while. 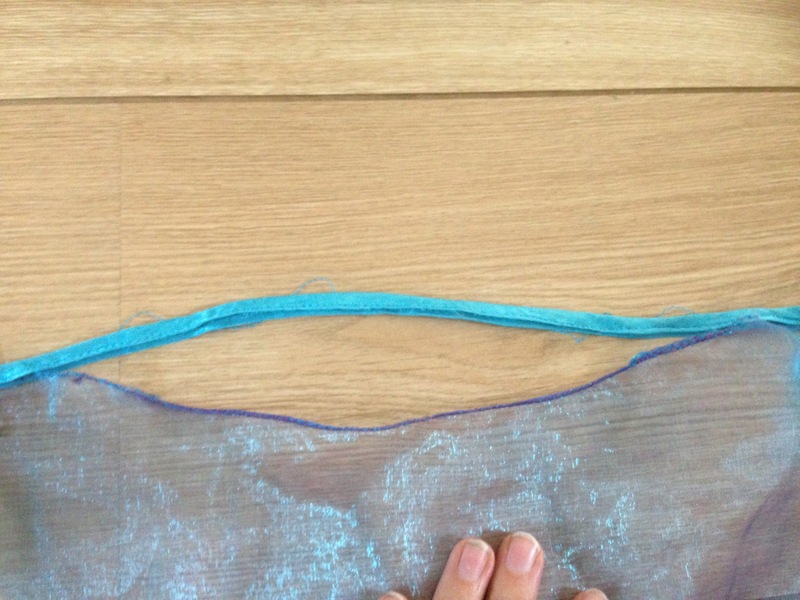 Sew along the edge of the bias tape, capturing the edge of the veil between the tape. Go slowly and make sure you’re sewing through both sides of the tape. Check for missed spots and fix them by sewing over the biastape again, slightly closer to the edge and this time surely capturing both sides of the tape. There you go, one neatly edged veil, ready to go! I’ve been working on the Moon Goddess costume as my performance is due next Saturday. I finished a double layered white chiffon circle skirt that is part of the Goddess costume. It is now hanging upstairs, waiting to be danced in. The belt is mostly done and is ready for fringe and more rhinestones. I’ll post a costume project update later this week. 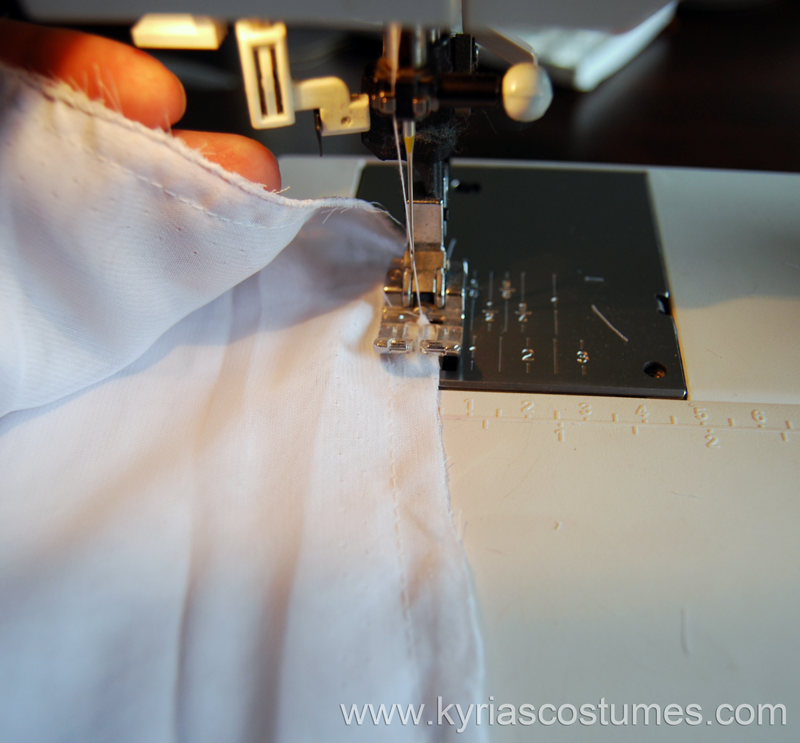 While making the skirt, I took a couple of close-ups to show you how to finish a straight seam with a regular sewing machine. What does an unfinished seam look like? to clean up the interior of your project. It just looks better. 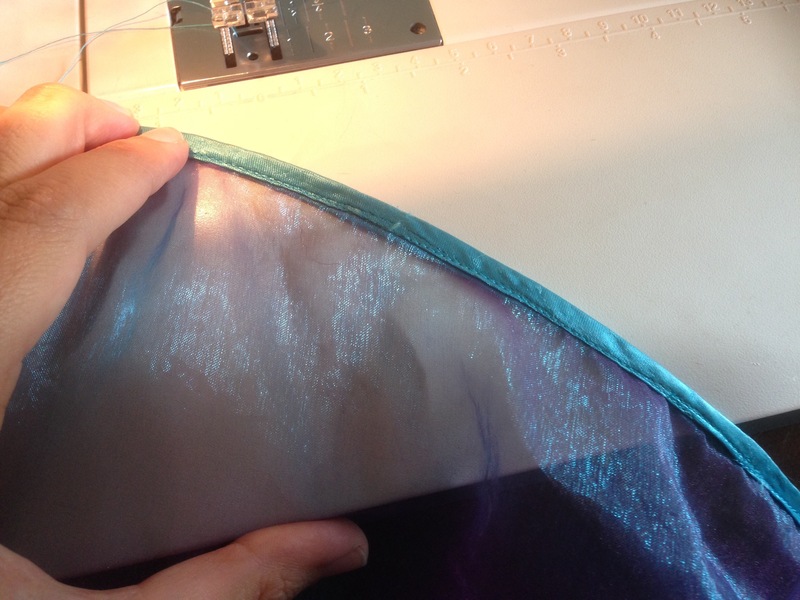 Finishing a seam if a proces that is almost identical for most fabrics. I use this techinque for almost all fabric types and it creates supple, neat, flat seams. Keep in mind that it works best for straight seams! Make sure you’ve stitched all the neccesary pattern pieces together and you’re ready for finishing your seams. Most patterns include a seam allowance of 2 cm. 4/5″. This leaves quite a wide seam on the inside of your garment that needs to be taken care of. 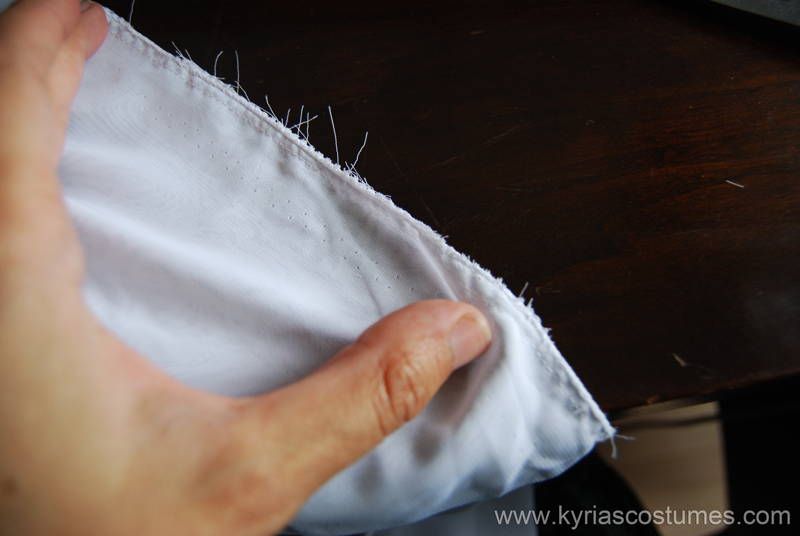 The first step is taking a pair of fabric sciccors and trim the seam allowance back to about 0.5 cm – 1 cm/ 1/5″-2/5″. Get your sewing machine out and choose a wide zig-zag stitch. My machine is automatically set to a seam length of 2 mm and a width of 3 mm. Feel free to experiment a bit with what suits you best: for example, a 5-6 mm wide sig zag also gives a nice finish. Stitch over trimmed edges of the seam, catching both layers with the same stitch. The end result is a narrow seam with a neat finished. 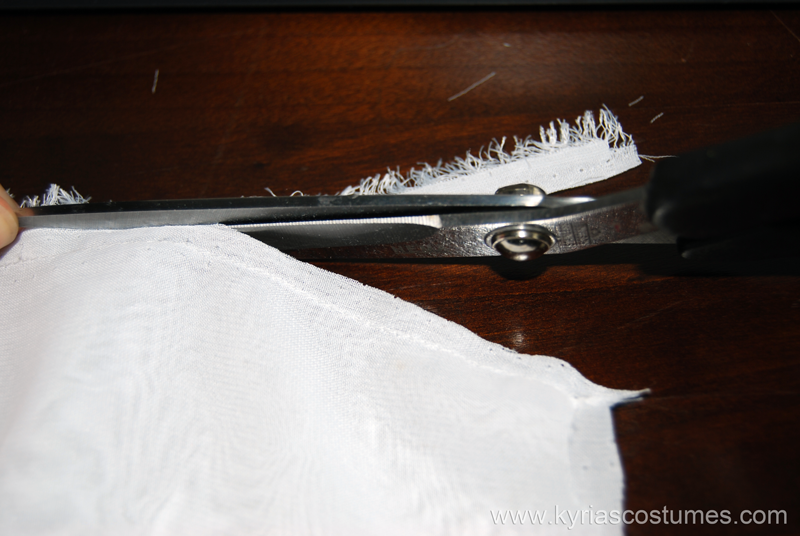 Sometimes small threads of the fabric escape from the seam: use scissors to trim it down. I am a bellydancer and costume-a-holic living in the Netherlands. I enjoy blogging and I have big plans for the future with regards to writing and publishing books and such. All that, and a full time day job too! If you enjoyed this post and like to kept in the loop, please like Kyria Bellydance on Facebook or follow me on Twitter. Leave your questions or comments in the box below, or let me know through Facebook and I might write a blog post to answer your costuming question. In my last post I mentioned a quick way to cut the hemline of circle skirts when you’re in a hurry. After cutting, the hem still needs to be finished! 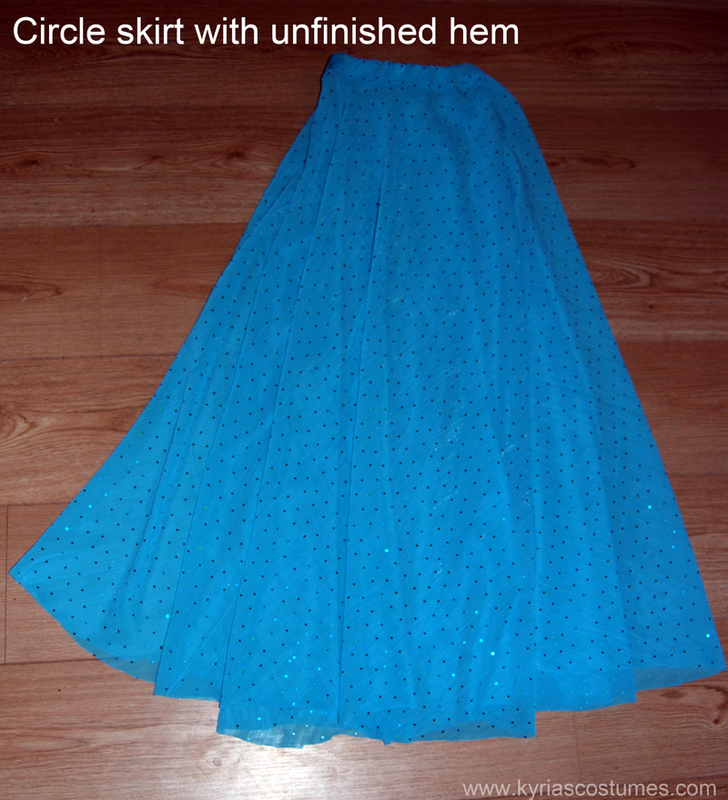 This blogpost is about the different ways to finish the hemline of a circle skirt. Before I start on the techniques, let’s have a quick look at the shape of the hemline and the material of the skirt. These two factors are important for deciding which type of hemming works best for your project. 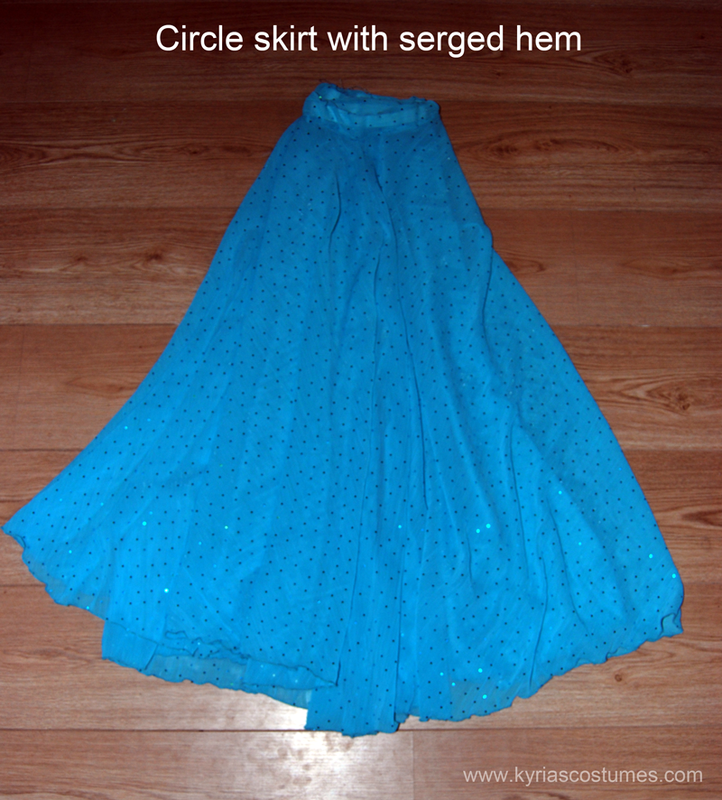 A circle skirt is made out of panels cut in a circle shape, creating a rounded hemline. This is important as rounded hemlines can’t easily be folded over. Try it with a circular piece of paper: if you fold the edge inwards, several folds along the edge are needed to fold the paper inward all along the edge. 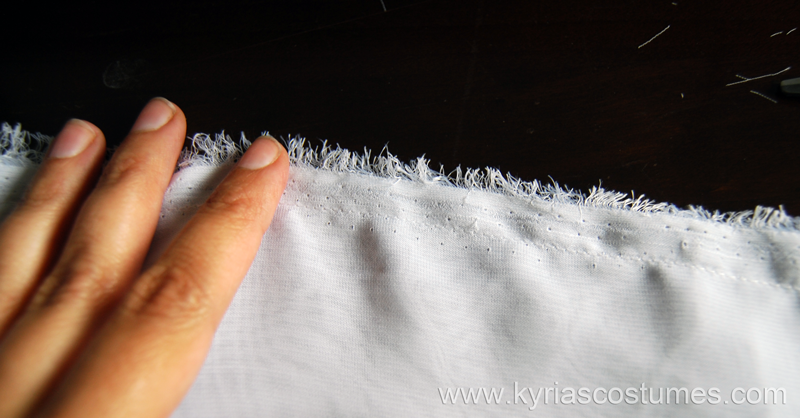 The same thing happens with fabric: the ‘ fold over and stitch-technique’ will create a messy hemline. The second factor is the fabric. 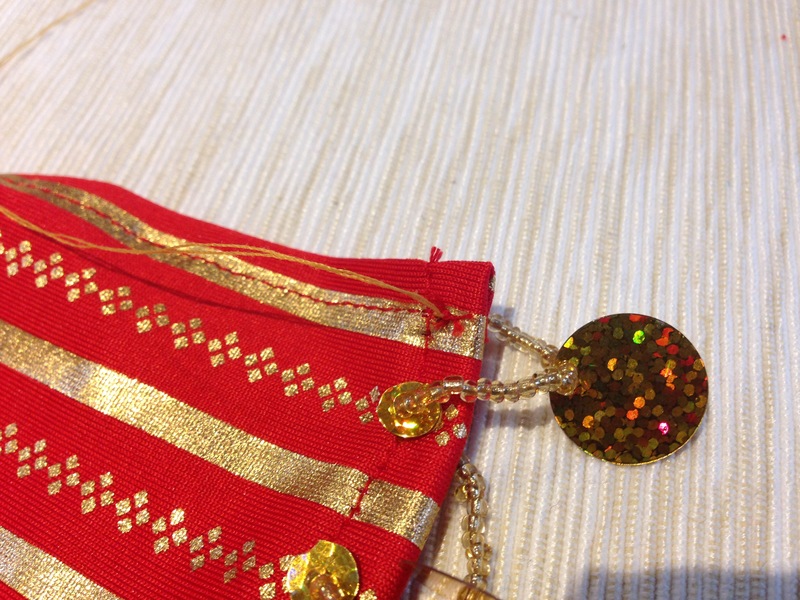 I used a chiffon like fabric: a semi transparant woven fabric. 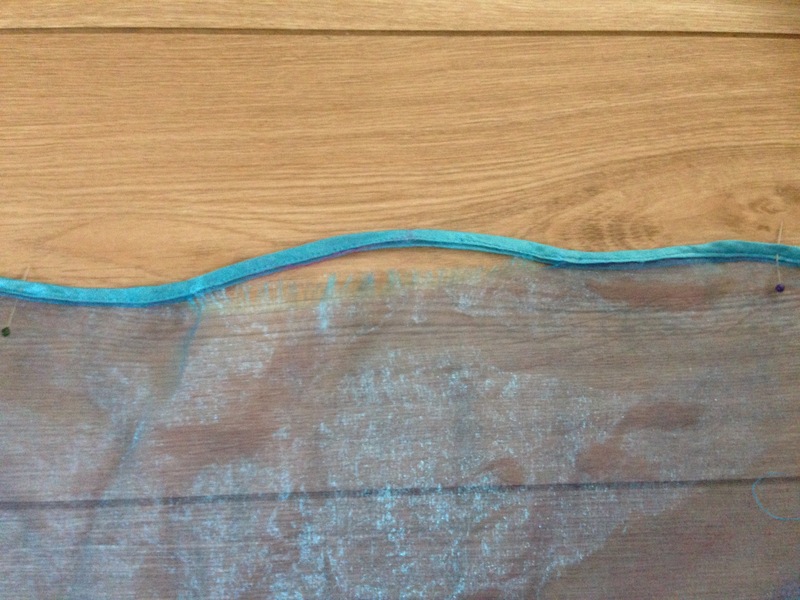 There is a slight stretch to it (normal synthetic chiffon doesn’t stretch), making it easier to use techniques that require a bit of stretching and fiddling with the fabric while hemming. What are these ‘techniques’ I keep talking about? When I mention ‘technique’ I am talking about different ways to sew something. For instance, a hem can be finished by a fold-over-and-stitch- technique, or a rolled hem technique. In both cases, the skirt has a finished hemline. The result of each technique might be slightly different. That’s why it’s important to learn about different techniques. Remember my adagio costuming is about what works for you? Sometimes a rolled hem might work, sometimes a serger might be the answer to all your problems. Fold over hems are prefect for straight hemlines and give a great result, but are unsuitable for curved hemlines. Being able to use different techniques and being able to judge what technique will give the desired effect is the sign of a good seamstress. This is a circle skirt with unfinsihed hem, to give you an idea of how the hemming technique can change the look of the skirt. Use the fingers of your right hand to slightly roll the edge of the fabric inward, and stitch right on top of it so it stays put. The fraying edge of the fabric is neatly tucked away. The nice thing about this technique is that it is a fairly simple concept. The tricky bit is that rolling fabric by hand while operating your sewing machine can get messy and result in uneven, quite big, rolled hems. I highly recommend investing in a sewing machine foot called the ‘rolling hem foot’. What it does is roll the fabric for you, as long as the fabric edge is fed into the foot in the right way. Sometimes it is included with your machine but if it is not, go to your local sewing machine store and order it. It will change your life for the better. With a rolleed hem foot, creating even, neat and narrow rolled hems is a walk in the park. It takes a bit of practice and after that you’ll be hemming in no time. Roll hemming creates a narrow, roll like hem. If you’re into fancy finishes, try edging your circle skirt with fish line! It is a relative easy proces. Instead of a normal roll hem, sew fishing line inside the rolled hem. The fishing line comes from a spool and thus creates a meandering, lettuce like effect. Sparkly belly has a more extensive post about this technique on her website. This technique creates a hem that is rolled, and falls in natural curles and curves. 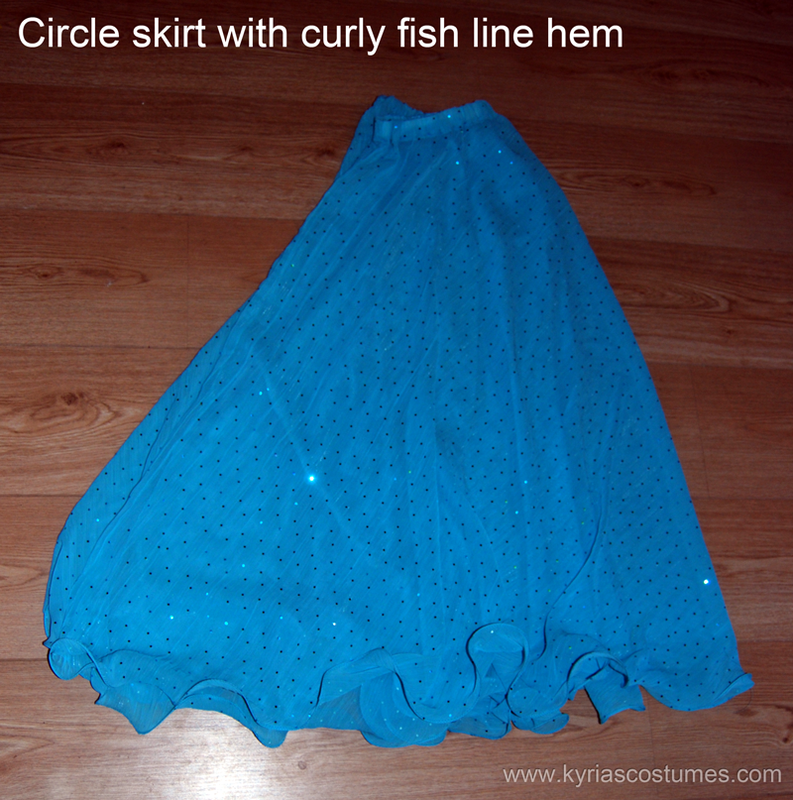 For tutorials about how to add fishing line to the hemline of a skirt, try this curly hem tutorial on Youtube, this tutorial by Sparkly Belly. It is fairly easy to add the fishing line to the rolled hem and I really like the results. So floofy! For your enjoyment, here is a quick overview of the effect of the different hemming techniques. If you enjoyed this post, please like Kyria Bellydance on Facebook or follow me on Twitter. If you have a question or comment, let me know through Facebook and I might write a blog post to answer your costuming question.